For asparagus lovers, this is your time of year. 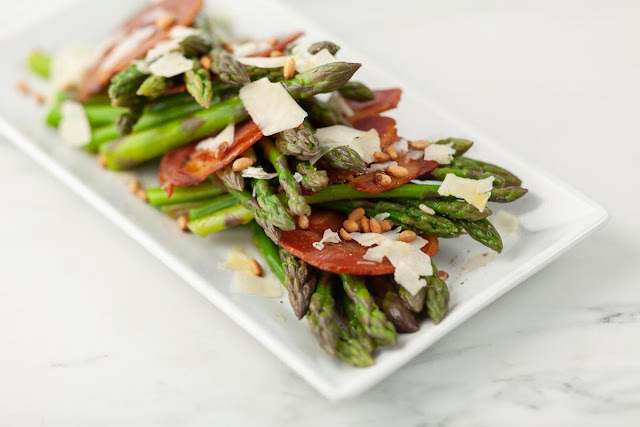 Among the many ways to prepare this seasonal favorite is this easy, yet tasty recipe from Nugget Markets - asparagus with pancetta and pecorino. Heat oven to 315ºF. Lay pancetta on a rimmed lined baking sheet. Place a piece of parchment over the pancetta and press flat. Place another baking sheet over the top to keep the pancetta flat as it bakes, 30 to 40 minutes or until is browned and rendered. Remove from oven and set on a paper towel and hold warm.